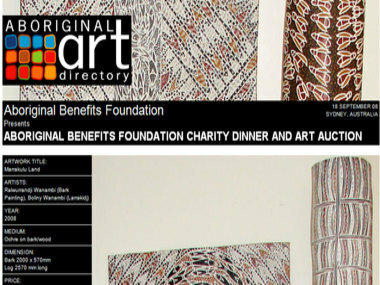 A gala benefit to raise funds for the proposed "Rerrantjun Healing centre" Yirrkala, Eastern Arnhem Land. Driven by Artist Banduk Marika and supported by 80 individuals in the Yirrkala community, this Healing centre will address the pressing needs of adolescents and families suffering stress and psychological crisis due to many causes, but including substance abuse and depression. Based on a unique concept of integration of mainstream medicine and Yolngu (Aboriginal), the building is to be circular around a beautiful sacred Banyan Tree. A work has also been donated for auction by artist Imants Tillers. ART auction and dinner by ticket sale only $250 per head. Dinner and Auction: 6.30pm, Thursday 18th September 2008 at the Museum of Contemporary ART, Sydney. For more information or credit card bookings, please call 0425 233 447.